Your set of custom dice is essential to claiming victory during a game of Runewars Miniatures Game. After all, you may be able to maneuver and wheel your troops perfectly into position, but you’ll want to have your dice close at hand when it’s time to attack. 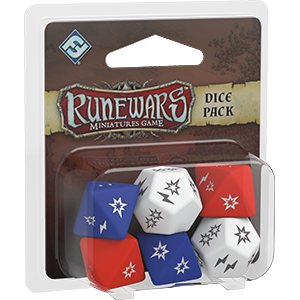 The Runewars Miniatures Game Dice Pack offers you a tool of convenience: another set of custom attack dice, identical to the set that you receive in the core set. When you’ve added the dice in the Dice Pack to your dice from the core, it’ll be easier than keep to keep your focus where it belongs – on the deeply tactical movements and combats of Runewars.